Etching is an old and contemporary method of the printmaking art form. Also called intaglio. Other methods include woodcuts and lithography. Goya, Picasso, and Australia’s Arthur Boyd are well known artists who made etchings. 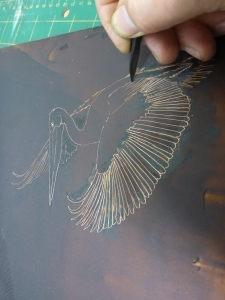 Printmaking can take many years to master and much of the skill is in printing the plate. 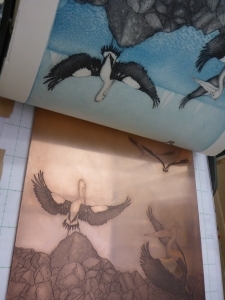 Making and an etching plate involves creating recessed lines and textures into a copper plate. First a polished plate is applied with a layer of acid resistant ground. A general technique of making a design involves drawing through the ground with a fine pointed tool exposing the metal. A modulated surface for tone effects can also be created on a plate. The exposed lines are later ‘etched’ away or corroded by placing the plate in a bath of ferric chloride. Once I’m satisfied with the depth created by the solution it is then wiped away with turpentine revealing an engraved plate. The finished plate can thence be applied with oil based inks for the printing process. 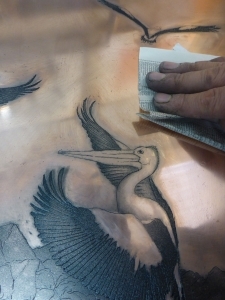 When preparing etching plate for printing, ink is thoroughly applied into the etched lines and textures. The excess ink on the plate is then carefully wiped with a special cloth called ‘tarletan’ and final wiping stages can be made with thin paper and cotton buds. Finally the prepared plate is placed on the press bed and soaked art paper is placed over it. It is then moved between two high pressure rollers and a buffer of felt. The paper is moulded into the plate creating the unique printed surface on paper. Intaglio can also make use of complex variations in technique such as using multiple plates to construct an image of layered colour.